The LMC via their Twitter handle posted this...but I strongly believe its just not enough and three points and three goals must be awarded to Enyimba FC and every other teams they failed to appear for a match. Missing the match against Enyimba FC this Wednesday 18th May, 2016 is the third time this season that Giwa FC have failed to appear for their home match in this current NPFL season and surprisingly the League Management Company has failed to act (or better still reluctant to act). Giwa Fc was suspended for three matches from playing in Jos and was banished to play in Kwara State. 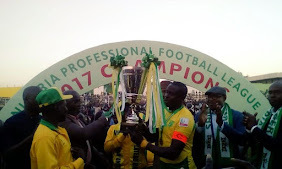 The NPFL rule says that if a club fails to appear for a league match for three times then they will be expelled and banished from the League.